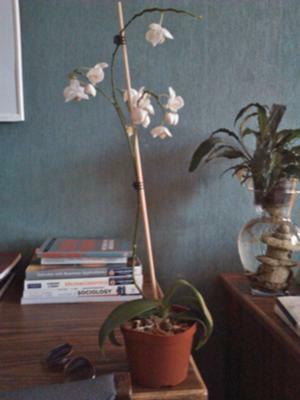 My Orchid Is Sick, Can You Help? I've had my Orchid for about 6 months now. When I first got it, it had several shoots off the main stem and a pretty good amount of buds. Over the next 5 months, it continued to bloom and maintain a very healthy appearance (it had up to 30 blooms at once). I kept it on my south-facing windowsill where it got a pretty good amount of sunlight but not directly. I also watered it about once every 2 weeks (mostly just when it felt dry) and I pruned it by removing the dead blooms. I took it home with me over Christmas break and discovered mold covering the top layer of moss. At this point, the leaves were still firm and green and only a few of the buds had begun to die. While home, I took it to a local plant nursery to see what they could tell me about it. Apparently the people I bought the Orchid from had potted it entirely in moss. It had been holding too much water and the roots had started to rot. The people I took it to kindly repotted it for me, removing most of the moss and replacing it with Orchid bark. I was immensly relieved as they told me that overwatering was my problem and that as long as I only watered it a little every 2 weeks, it should not take long for my Orchid to recover. I have followed their instructions, but unfortunately my Orchid has continued to deteriorate. The leaves are now limp and fading, still green but lightening. They are also starting to shrivel a little bit. The blooms, although still alive, are starting to droop and I haven't had a bud bloom for over a month now. I'm at a loss for what to do. I've been researching Orchids for the past week or so to try and figure out what to do to help it but I haven't found much. One article did say that Orchids get tired after having bloomed for so long and should be trimmed back after a certain amount of time. Should I trim my Orchid? And if so, how much? Also, I just discovered that the pot it's in has holes in the bottom (I had it sitting in another pot so I couldn't tell). Since I only water it once every 2 weeks, could it be possible that all the water is draining out and it's not getting enough (the pot I had my Orchid pot in had standing water in the bottom)? Thank you so much for your help. 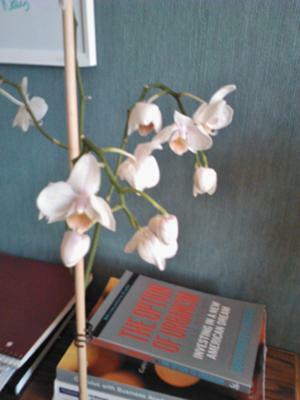 My Orchid was a gift from my brother and it means a lot to me. I'll try whatever possible to keep it from dying. Comments for My Orchid Is Sick, Can You Help? No worries, questions are good. It is great that most of the roots are intact. This is really good news. It is hard to say if the few spots are just root material or if they are disease. But the fact that there are roots is a great sign. Really. with hydrogen peroxide. If the spots fizz then they are quite possibly disease. Start with the peroxide and then really liberally dust the roots with cinnamon. You ask: What do you think? Should I try to trim off the dark spots that I can? No do not open up the roots until we know for sure they are diseased. Just test them with the peroxide like I said and see. If they start to rot we can always cut them out later. A picture would really help me advise you better. Take a picture of the roots and of the plant as a whole. Close up of the roots if you can. You can either send one to me directly at melissa@orchids-plus-more.com (I check that email every couple of days but post a comment if you go that way and I will look. Or even easier just start a new thread with the picture. Just identify yourself and what it relates too. Thank you so much Melissa, I understand now. One last question and then hopefully I'll be finished. I went ahead and trimmed it where you said to, right above the crown, and then removed all of the media. When I went to trim the roots, however, I discovered that most were intact. 3 or 4 out of the whole bunch (we'll say there are 15 total) were completely dried out but the rest look pretty good, just a little dry. They do have a few dark brown/black spots here and there (some just at the tip of a healthy looking green root) but I can't tell if they are because of root rot or just the way the roots look. What do you think? Should I try to trim off the dark spots that I can? I'd post a picture for you but it looks like I can't do that through commenting. Hope you're having a great week! You are welcome, I hope I am able to help this particular orchid as well. When you say the crown, you mean the leaves right? Yes, by the crown on a Phalaenopsis I mean the center place where the leaves originate from. And also, there is a node an inch above the crown (if you mean leaves), should I cut an above or below the node? If by a node you mean a little bump or nub on the flower spike where a flower blossom was originally attached to then, yes, that is a node. With this plant I would cut it an inch above where the spent flower spike goes into the crown. I am surprised there is a node so close to the crown. I would generally cut it off for this plant as you are trying to save the plant and do not want to try to force a flower spike from a node. But the point of cutting an inch above the crown is to let the spike die off without hurting the crown. Make sense? 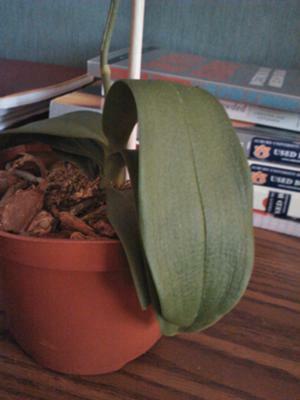 Your last questions: It's been about a week and a half since I last watered my Orchid. Should I water it at any point in between now and the first few cinnamon treatments? 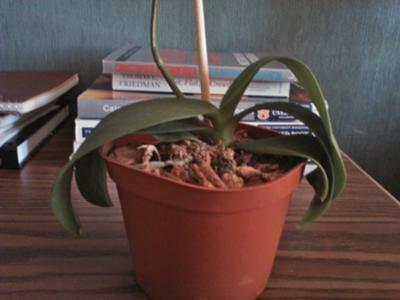 I can not see my specific answer as I type this but I thought I recommended pulling the orchid out of the media it was in and treating the orchid with cinnamon and peroxide and maybe a fungicide. I would get the orchid out of the media and treat with cinnamon as soon as possible. It can deal better with lack of water more than it can deal with rotting. If that is what I said, make a point to get it out of the contaminated media. I know the media is new but it probably still has fungi growing in it and you want to give this plant the best chance. Once it is out of the media you can water the plant, assuming it has roots. I the roots are dead remove them in the manner I mentioned before and then let the cuts heal before watering, at least a couple of days. Then, water it (in the morning as it will have longer and warmer time to dry) and let it dry by sitting out on a plate or pot and let it dry. Do not let water sit in the crown (the center of the leaves.) You can remove any standing water with the corner of a paper towel or a cotton swab. Water on the orchid for very long (like hours) will encourage the rot. Once again, thank you so much for your help! Your more than welcome. Let us hope that this helps. When you say the crown, you mean the leaves right? And also, there is a node an inch above the crown (if you mean leaves), should I cut an above or below the node? Last one, it's been about a week and a half since I last watered my Orchid. Should I water it at any point in between now and the first few cinnamon treatments? Once again, thank you so much for your help! I wish I could say that I think that your orchid will recover at this point but I am not sure it will. The main issue here (and you know this already) is over-watering, as you know. Phalaenopsis are prone to root rot if the roots are too wet. That is what caused the mold (a fungus) to grow and fungi are difficult to cure. It was great you got help at the nursery. Moss was not the issue, per se. Many growers do grow Phalaenopsis in moss very successfully. The fact that your plant still continues to decline tells me that there is still rot in the roots. If it still has some healthy roots there is a little hope. Your situation is somewhat desperate. I think that your plant is dying, and you might not be able to save it. If it was my plant here is what I would do. Using a New single edged razor blade, cut the flower spikes off about an inch above the crown. Pull the plant out of the media and inspect the roots. If there are some healthy roots (they would be whitish or greenish, possibly brownish and somewhat firm) then I would try to save it. If they are brown,black and mushy and slimy I would expect that there was almost no hope. I would still try. Then cut the dead roots off o using a NEW single edged razor blades. Discard the blade after use. I would NEVER use a blade that had cut diseased tissue and then use it on healthy tissue as it will contaminate the healthy tissue. Then treat the plant, start by spraying or pouring over the roots 3% hydrogen peroxide. You can get this in a drug store. Then let that dry. Then sprinkle cinnamon (yes the spice) all over the rotten area and the root area. Put it somewhere where you can see it all the time. Like a pot. Set it in a pot but without media and really just on the top of the pot so that the roots are hanging out. Perhaps go back to the nursery and ask about a fungicide. Then watch the plant. If it seems to hold its own I might follow up in a week or so with more peroxide, let it dry and sprinkle with cinnamon. Or the fungicide. If it stabilizes then you would water it by just running water over the plant. Do not let water collect in the crown I would probably put it on a paper towel afterward to absorb some of the water. Then retreat with peroxide and cinnamon. The plant is not getting enough water, because the rot does not let the roots take up the water and translocate it to the leaves and buds. The fact that there was standing water in the pot your pot was in is not good. Phalaenopsis do not like to have their roots in water and often get root rot. They need to drain. I understand that this orchid means a lot to you. So I encourage you to continue to be proactive and try to save it. And if you can not, then replace it with one like it. And you will be able to know much better how to make it grow to keep it happy and healthy.